Crystal Healing is the use of crystals to bring about healing and positive changes in the mind and body. Crystal healing is a form of healing that uses crystals or gemstones. The crystals are mainly placed on specific areas of the body called \"chakras.\" Chakra is a Hindu term meaning spiritual energy. According to this teaching there are seven basic energy centers in the body, each having a color associated with it. Some crystal healers place the same color crystals as the color of the chakras on the person to enhance the flow of energy. Crystals are said to direct the flow of energy to the person in a particular part of the body and bring balance to a person\'s energy. Ultimately, they are used to cleanse the person from bad or negative energy believed to cause an illness. Clearing out the bad spiritual energy alleviates the physical ailment. Crystals are used for physical, mental, emotional and spiritual healing. Not only do people visit \"crystal healers\", in some places, professional nurses are being trained to use crystals for their patients. Additionally, crystals can be worn, placed next to a person\'s bed as they sleep, and in some cases placed around a person\'s bath. Crystal therapy aims to restore the balance and well being of a person. 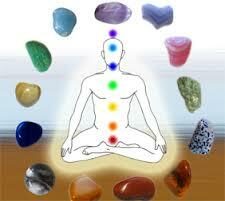 In this therapy assorted stones are placed on or around the body that resonate with chakras of the body. This helps to release impending blockages, refining the flow of energy. The recipient is able to experience a deep state of tranquility, letting go of attitudes and habits that are not beneficial, assisting in tuning ourselves to the rhythm of life. Crystals work on the subtle energy levels and in our auras to rebalance energies and improve our well-being. This therapy promotes peace and tranquility and reduces mental and nervous stress. Quartz: For crystal healing, quartz is the most popular and extensively used crystal. It comes in many kinds, colors, shapes and size, among which are amethyst, citrine, clear quartz, snow quartz, smoky quartz, etc. I started out with the quartz crystals, learned as much as I can and started to work with a few Quartz family of crystals. Clear quartz: Come as points, clusters, druze, in all sizes, shapes and inclusions. Quartz crystal unblocks energy centers and helps the body heal. Simply holding a quartz point each day helps boost the immune system. Gems and Crystal healing for the Beginners: About an eighth of the world's crust is quartz, and it has been used in buildings for thousands of years. Many ancient people mistakenly believed clear quartz to be fossilized ice, Roman ladies used to carry quartz balls to cool their hands when the weather turned warm. I find clear quartz are very helpful in meditation. It helps the mind to focus; it helps dispel negativities. Rose Quartz: Soft pink color in itself is very calming. It is the stone for self- love, to uphold self-esteem when it is being compromised, a calming stone. It helps promote forgiveness by releasing the anger and pain and the other negative energies. Rose quartz exposes emotional imbalances; keep a rose quartz in a room where arguments may likely occur; it helps keep the boiling point down. Sit with a rose quartz in meditation when you are feeling perturbed, helps calm you down emotionally and feel an inner peace. Amethyst: Comes in deep shade of purple or lilac. It is said that those who choose rose quartz are also drawn to amethyst. This is a spiritual stone, indicates creativity, capability of spiritual healing. Keep one under your pillow, reduces nightmares, enhances dream state. Amethyst is a good crystal healing against alcoholism. Citrine: Comes in deep orange-brown or bright yellow color. This stone does not absorb negative energies, also known as the merchant stone, good to hold when under stress and anxiety. It is a stone that helps one in polishing communication skills. 2006 to 2016 © All Rights Reserved.